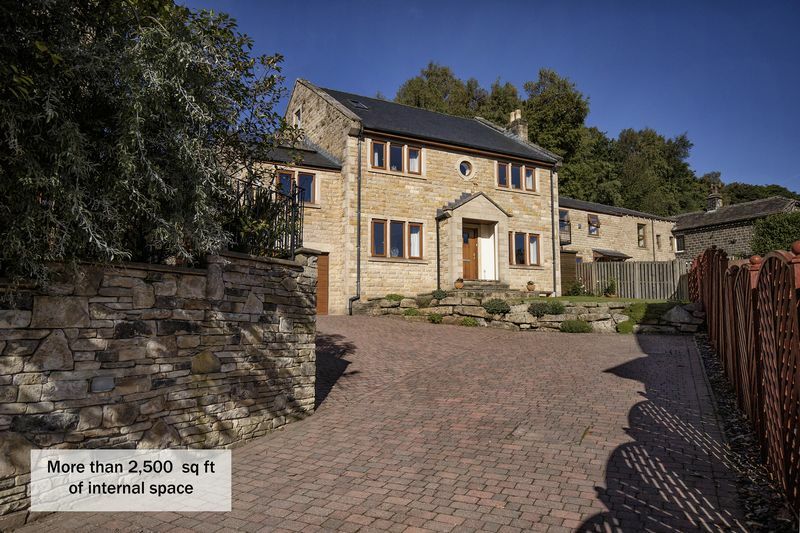 This individually designed and built detached family home offers deceptively spacious accommodation totaling approximately 2500 square feet. 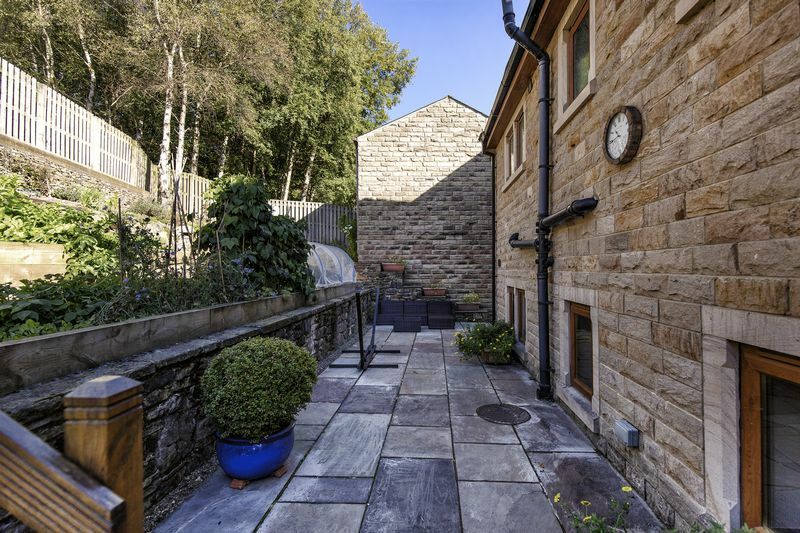 This ideal family home is within walking distance of Ripponden village and benefits from generous parking, an integral garage and gardens to the front and rear. 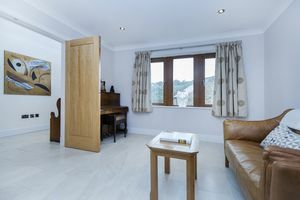 Planned to take advantage of the splendid views offered by this sought after location, this immaculately presented and generously proportioned property is designed to offer versatile living for a 21st century lifestyle, incorporating some of the latest developments in home technology. 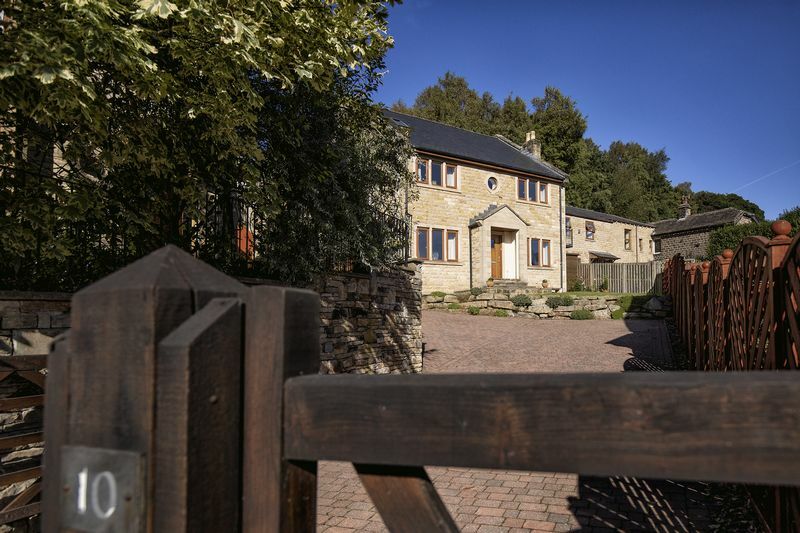 The light and airy reception rooms are situated to the front of the house and enjoy fine views over the surrounding countryside. 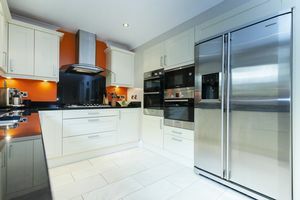 The breakfast kitchen houses designer units with granite worktops and an extensive range of integrated appliances with three ovens, five ring gas hob, chiller drawers and an American-style fridge freezer. 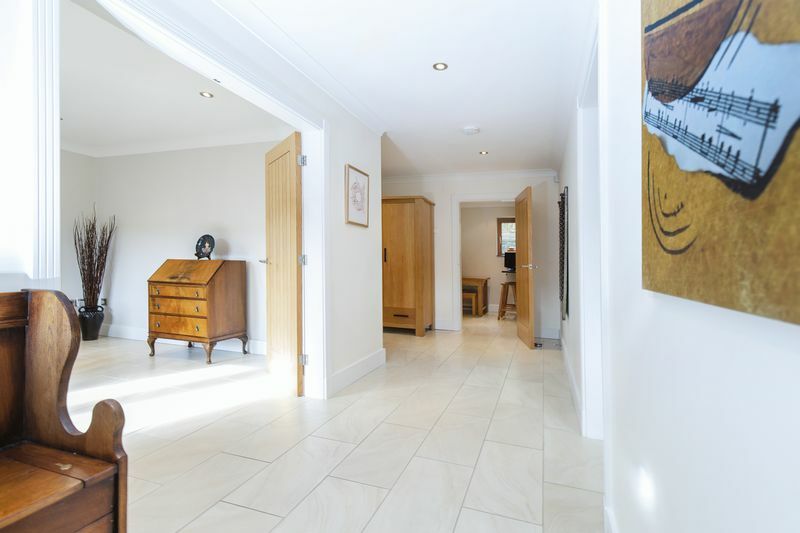 The hallway, dining room and dining kitchen have quality tiled floors with underfloor heating. 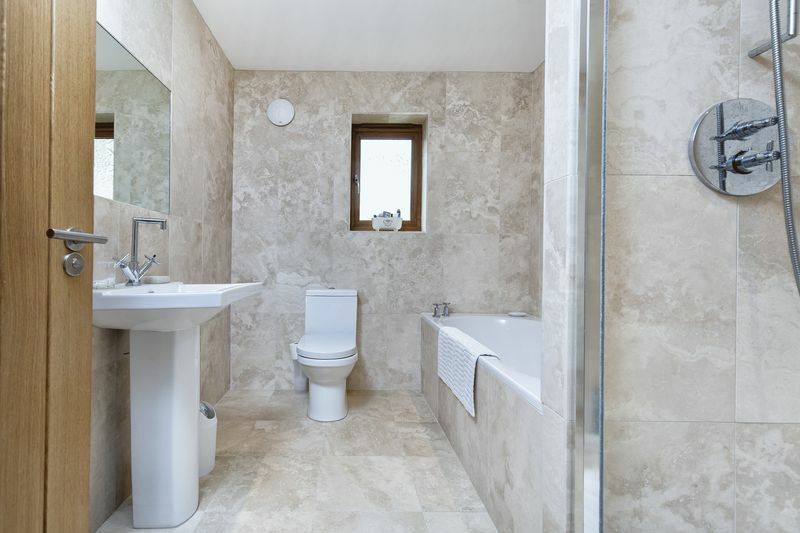 The five bedrooms are arranged over three floors allowing for flexibility of use and are complemented by an en-suite bathroom, an en-suite shower room, family bathrooms and a cloakroom. 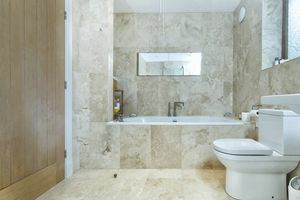 The generously appointed master bedroom includes a huge en-suite bathroom with four-piece suite including wet-room style shower area. The property is approached via a gated driveway, affording parking for up to 8 vehicles, leading to the integral garage and steps up to the front door. 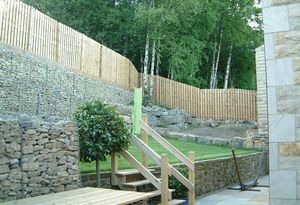 At the front of the property is an attractive lawn garden with dry stone walling and planting. The rear garden has been attractively landscaped with a stone flagged patio affording ample space for al fresco dining, decked steps lead up to a lawn and vegetable garden. To the side of the property is a garden shed. 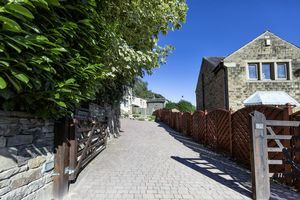 10 Excelsior Close is tucked away in the corner of an exclusive cul-de-sac, away from busy traffic, yet an easy stroll into the village and to the excellent amenities which include a school, health centre & pharmacy, library, and a selection of shops, pubs and restaurants. The M62 motorway (J22 & J24) is within 15 minutes’ drive allowing speedy access to the motorway network, Manchester and Leeds. All mains services. 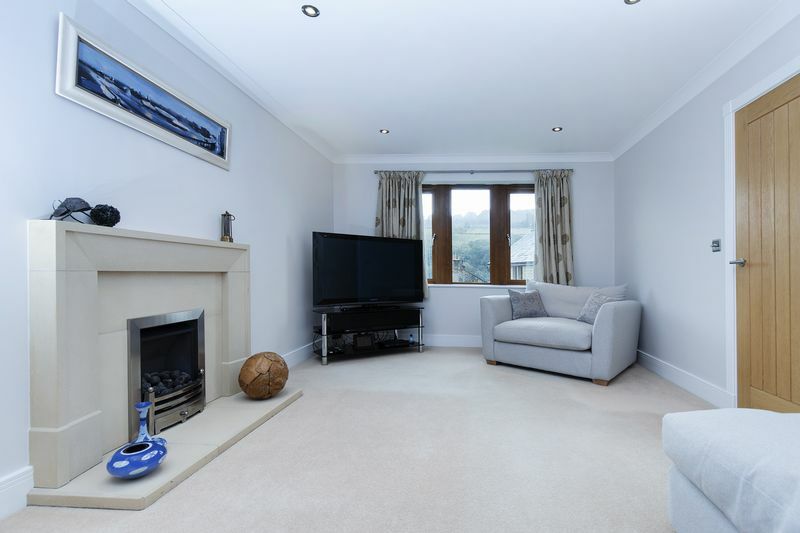 Gas central heating with underfloor heating to the ground floor. Double glazing. Solar panels to provide hot water. Control4 Media system to five rooms in the property. From Ripponden traffic lights take the Oldham Road towards Rishworth, passing the Cooperative shop on the left hand side. Proceed through Ripponden village, and Excelsior Close can be found on the right hand side after the Silk Mill pub. 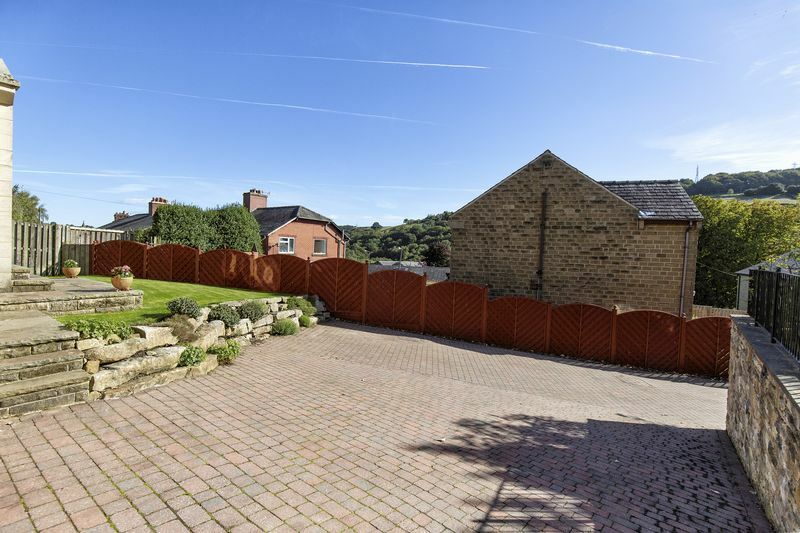 Turn into Excelsior Close go straight on at the top and the property is immediately on the right hand side. 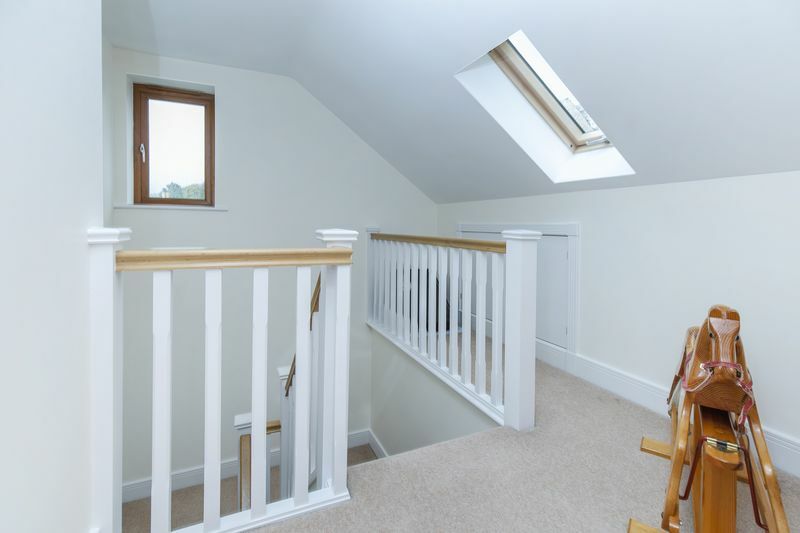 Return staircase to upper floor levels, tiled floor with under-floor heating and ceiling coving. A door gives access to steps leading down to the garage. Situated to the front of the property and commanding fine views over the surrounding countryside, limestone feature fireplace with coal effect real flame gas fire in stainless steel surround, under-floor heating and coving to the ceiling. The lounge benefits from access to the home media system. Accessed via double doors from the entrance hall this well-proportioned room is located to the front of the property commanding fine views, tiled floor with under-floor heating and coving to the ceiling. 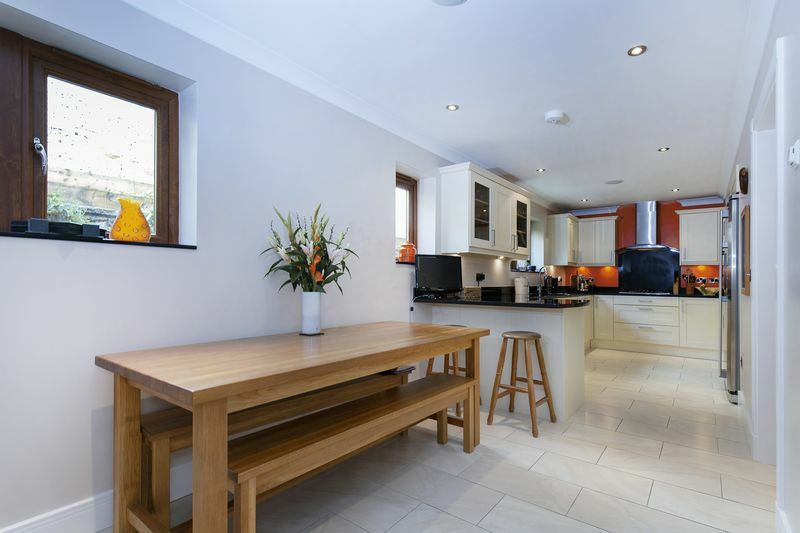 A beautifully appointed dining kitchen running the width of the property and located to the rear with views out to the garden. The designer fitted kitchen has an extensive range of wall and floor mounted units with granite worktops and incorporating a 1½ bowl stainless steel sink unit with drainer grooves inset to work surface, five-ring stainless steel gas hob with stainless steel and glass filter canopy over, three stainless steel ovens with matching microwave, integrated dishwasher, American-style fridge/ freezer and two chiller fridge drawers. The tiled flooring continues from the hallway with under-floor heating and coving to the ceiling. Recessed speakers link the kitchen to the home media system. Housing a two-piece white suite comprising wash hand basin and low suite WC, continuation of tiled flooring from the dining kitchen with co-ordinating half tiled walls, chrome ladder style radiator, ceiling light point and window. 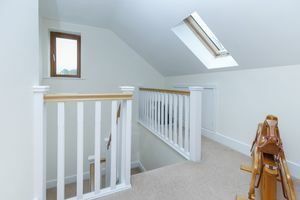 Return Staircase to first floor, window to the rear elevation and light point. Presently used as a home office but would make an ideal bedroom with double height ceiling and ladder staircase leading up to a mezzanine level. 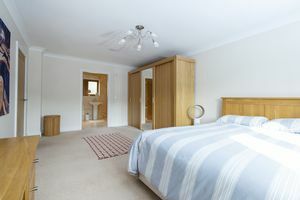 The bedroom is located to the front of the property with fine views. 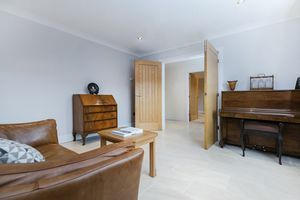 Recessed speakers link this room to the home media system. 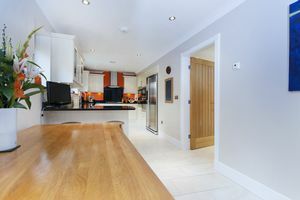 Useful utility room with granite worktop inset with a circular stainless steel sink and cupboard below, plumbed for automatic washing machine and vented for dryer. There is an external door out to the rear and a tiled floor. Return staircase leading up to the second floor. 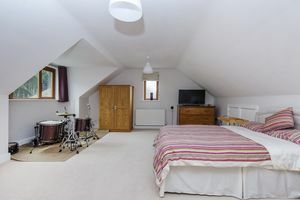 A huge master bedroom located to the front of the property and enjoying the fabulous views over the surrounding countryside, coving to the ceiling. Recessed speakers link the bedroom to the home media system. 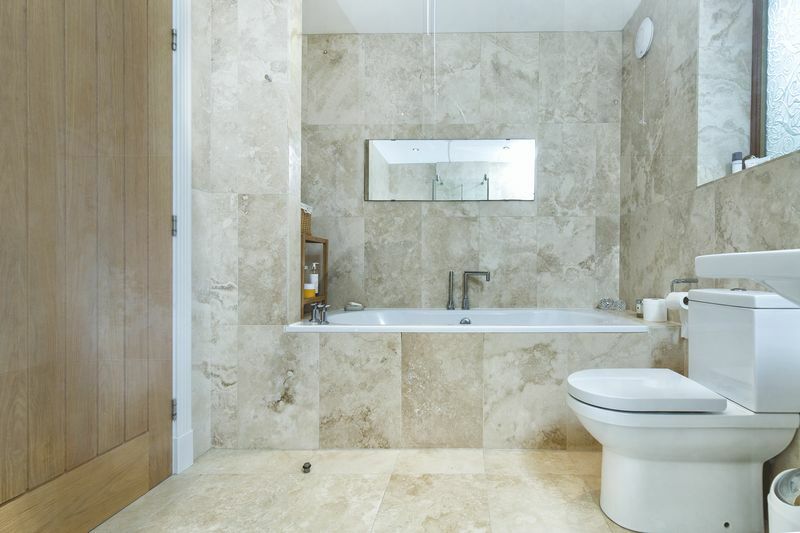 A generously proportioned en-suite, housing a four-piece suite comprising wet room style shower with glass screen and mains-fed power shower, double ended bath, pedestal wash hand basin and WC. 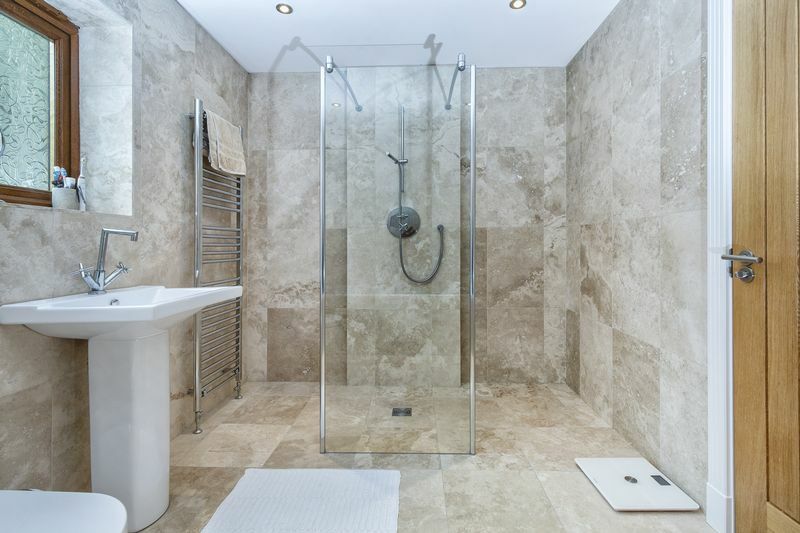 Fully tiled with beautiful limestone tiles and a chrome ladder style radiator. 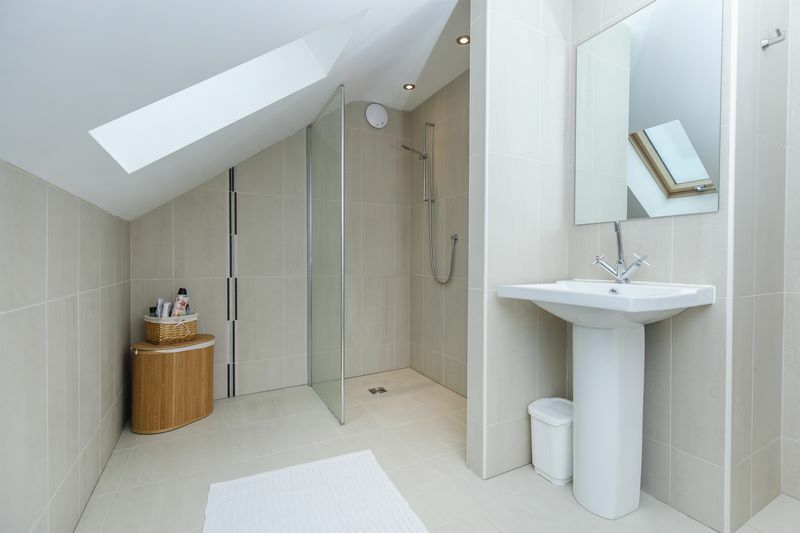 Recessed speakers link the en-suite to the home media system. Another huge double bedroom with feature circular window and additional window, both to the front elevation, with fine views and coving to the ceiling. 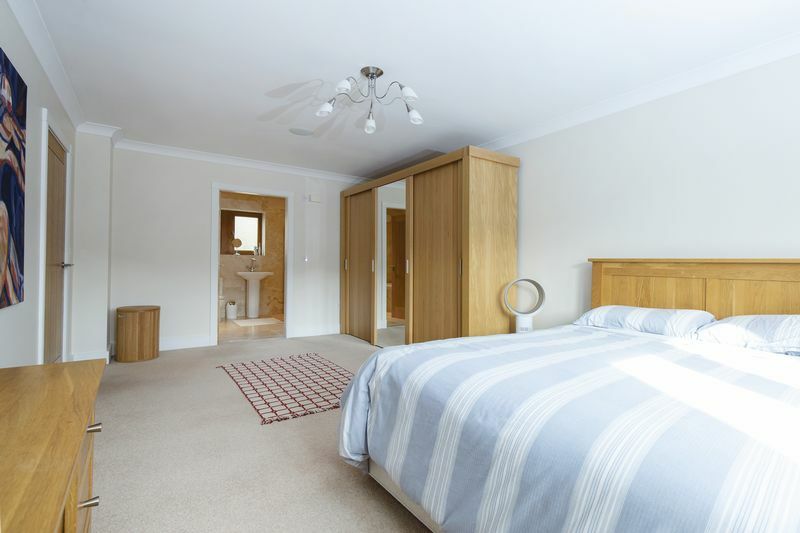 Located to the rear of the property overlooking the garden, another good sized bedroom. 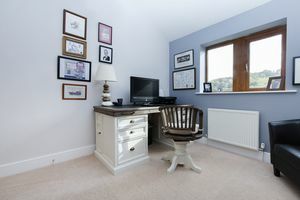 Speakers link this room to the home media system. 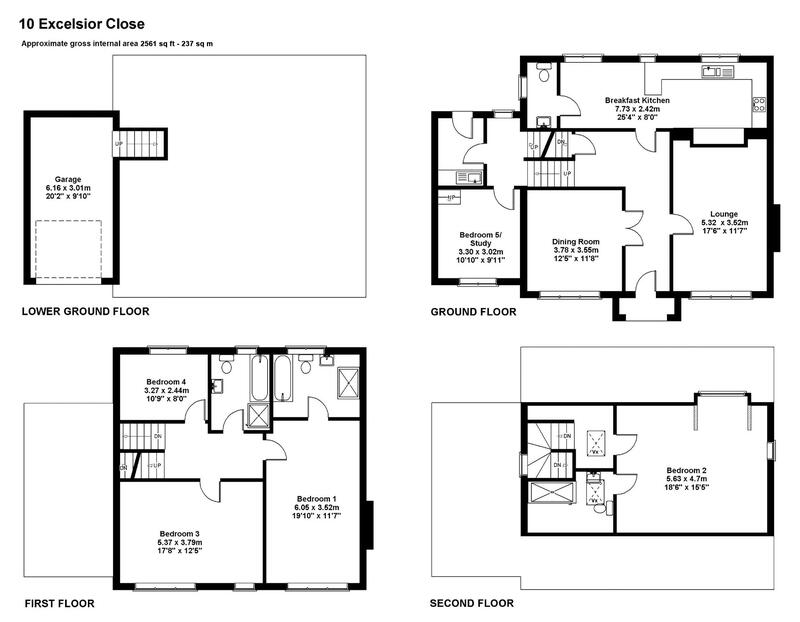 Housing a four-piece white suite with chrome fittings and comprising shower cubicle with glass door, double ended bath, low suite WC and pedestal wash hand basin. Beautiful limestone tiles to the walls and floor, an obscure glazed window to the rear and a chrome ladder style radiator. 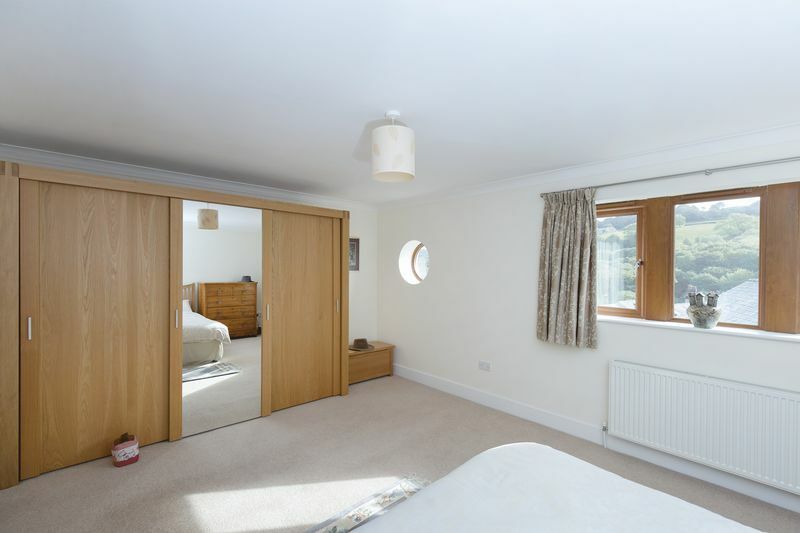 Window to the side elevation with far-reaching views, sky light window and access to eaves storage. 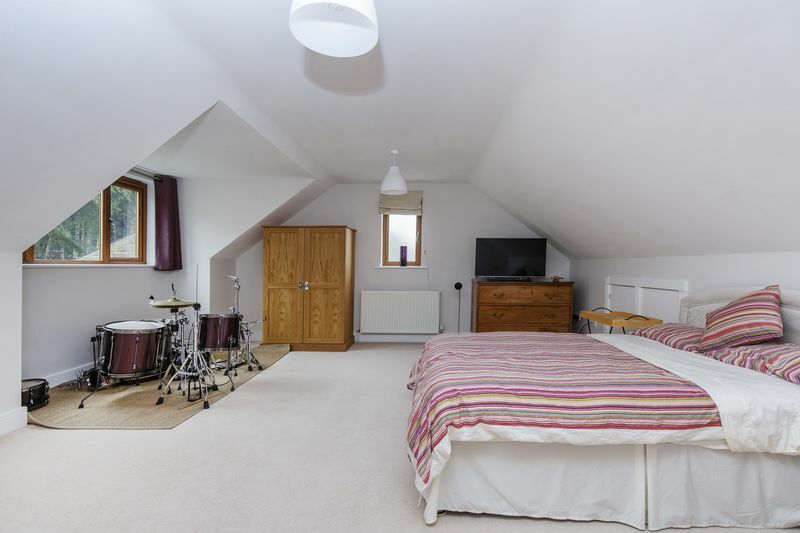 Another huge double bedroom, making an ideal guest suite, with views over the rear garden, two ceiling light points and access to eaves storage. Housing a three-piece white suite comprising wet room style shower with glass screen and mains-fed power shower, pedestal wash hand basin with mirror over and WC. 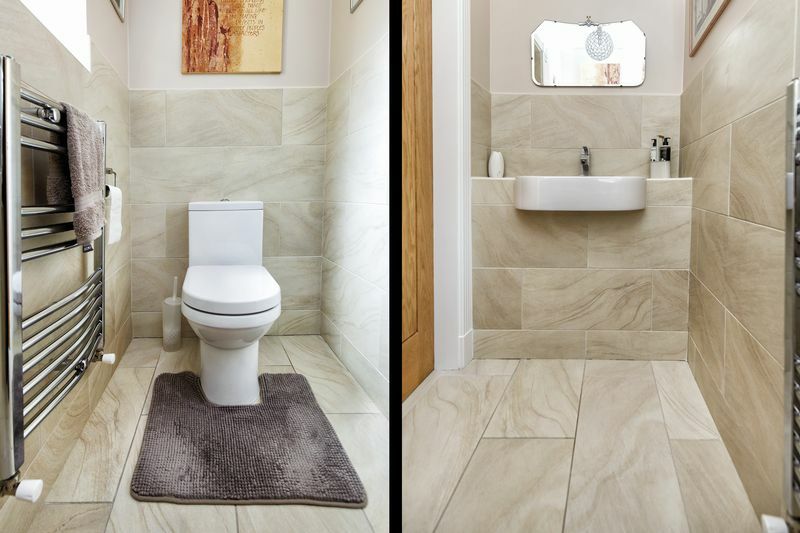 Co-ordinating half tiled walls and tiled floor, and chrome ladder style radiator. Integral single garage having an automatically operated roller door, electric light and power. 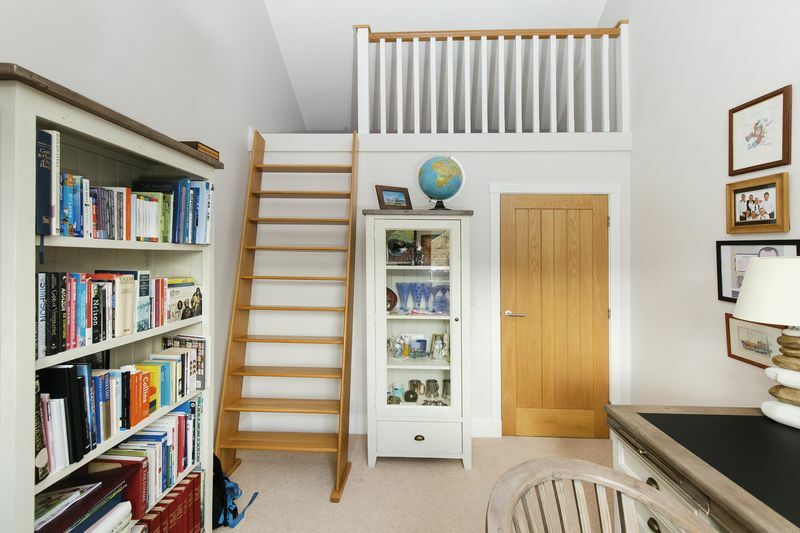 Internal steps link the garage with the rest of the house. 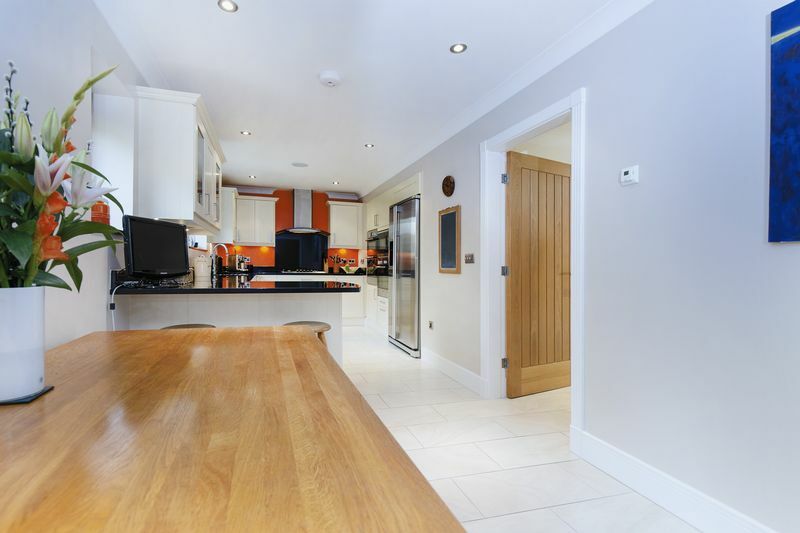 The garage houses the gas combination boiler, water tank and solar heating controls and the Control4 media and CCTV control cabinet. 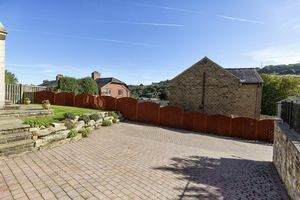 The property is approached via a gated driveway affording parking for up to 8 vehicles and leading to the integral garage, with steps leading up to the front door. To the front of the property is an attractive front lawn with dry stone walling and planting. The rear garden has been attractively landscaped with a stone flagged patio affording ample space for al fresco dining, decked steps lead up to a lawn and vegetable garden. 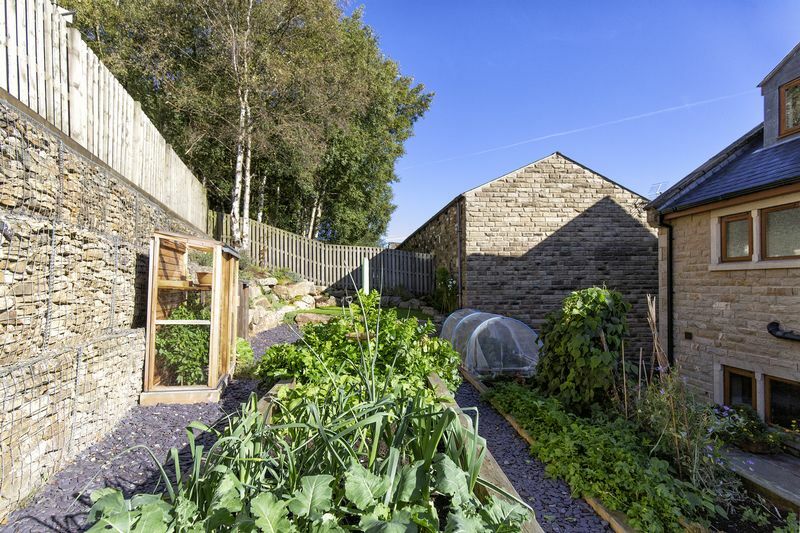 To the side of the property is a garden shed. Mains gas central heating featuring underfloor heating to the ground floor and hot water radiators to the remaining floors. High-tech pressurised system with solar powered hot water affording ample hot water to all bathrooms etc.